(AlJazeera) At least 7,500 people, including disaster victims and popular figures, gathered at a park in the city centre on Sunday, shedding light to the natural disaster two years ago that killed 19,000 and sparked a nuclear meltdown at the Fukushima Daiichi nuclear plant. (The Japan Times) Tens of thousands of people including musicians, a Nobel laureate and Fukushima residents converged on Meiji Park in Tokyo Monday to vent their anger about the Fukushima No. 1 nuclear plant crisis and demand the abolition of atomic power. 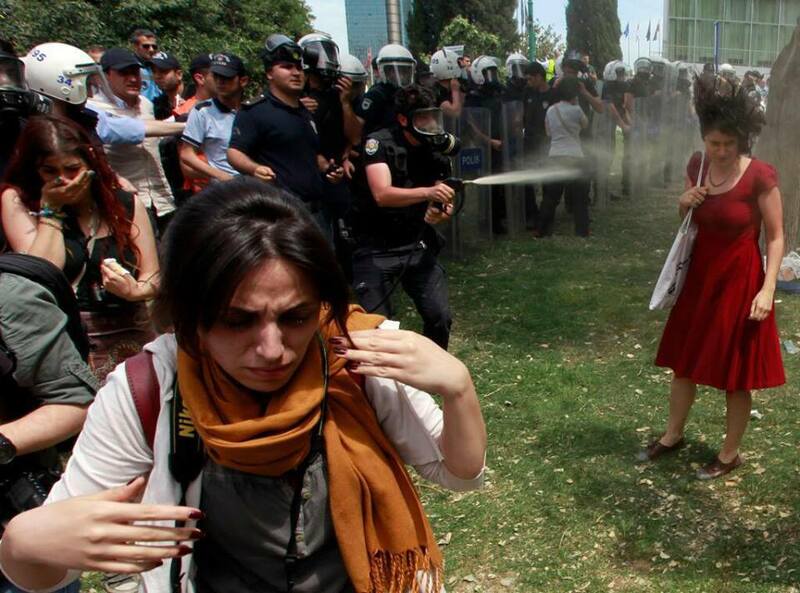 Taken from Occupy Gezi’s Facebook page. Four days ago a group of people who did not belong to any specific organization or ideology got together in Istanbul’s Gezi Park. Among them there were many of my friends and students. Their reason was simple: To prevent and protest the upcoming demolishing of the park for the sake of building yet another shopping mall at very center of the city. There are numerous shopping malls in Istanbul, at least one in every neighborhood! The tearing down of the trees was supposed to begin early Thursday morning. People went to the park with their blankets, books and children. They put their tents down and spent the night under the trees. Early in the morning when the bulldozers started to pull the hundred-year-old trees out of the ground, they stood up against them to stop the operation. (ROARMag) In 2011, a rebellious genie was let out of the suffocating bottle of the neoliberal world order. Ever since, world leaders have been struggling to put it back into place. This weekend, right when they started to feel that the genie had finally been contained, the revolutionary spirit arose once again in an unexpected location: in rapidly developing Turkey, a regional success story and darling of global capital and the neoliberal West. What began as a local struggle over the last green space in Istanbul’s urban landscape has now escalated into the biggest challenge to Erdogan’s 10-year rule and, according to some, “the most widespread civil unrest in Turkish history.” In an irony of historic proportions, the democratically elected leader who famously called on Mubarak and Assad to listen to their people and step down is now defying protesters with the same short-sighted authoritarian machismo of the dictators from whom he so avidly sought to distance himself. For four days, Istanbul has been shrouded in thick clouds of tear gas as violent clashes between protesters and police have left the city’s streets resembling a war zone. On Saturday, police were forced to retreat from the iconic Taksim Square, which has since been occupied by tens of thousands of protesters. Violent demonstrations quickly spread to the capital, Ankara, and 70 other cities throughout the country. After Amnesty condemned the government’s brutal response to the initially peaceful protests, which left thousands injured and at least two dead, the protesters have become increasingly determined to push Erdogan from power. In a sign of their radical determination, protesters in Beşiktaş erected massive barricades and even commandeered an excavator, breaking through police lines in an attempt to reach the prime minister’s Istanbul office. Between the indignant roar of the protesters, the ominous hissing of the tear gas cannisters and the deafening sound of police sirens, one can slowly start to discern the revolutionary whispers of a newly empowered people. (endthelie.com) According to a Japanese news outlet, Iza, on July 1st, 2011 63-year-old Mr. Takashi Kabayama was found dead with a plastic bag over his head in his home office. Kabayama was a member of the Tokyo Metropolitan Assembly for the Liberal Democratic Party and had been measuring radiation in an assortment of locations throughout Tokyo. He would then upload his findings to his blog for the world to read and on the day before he died (June 30, 2011) he measured 0.25 microSv/h in Mizumoto Park in the Katsushika ward located in Tokyo. Fukushima Diary reported on February 22, 2012 via Gendai that ludicrously high levels of cesium contamination were discovered, also in Mizumoto Park. It is strange that this hasn’t been brought to the public’s attention sooner, because the fact that he was found at 3 AM July 1, 2011, meaning just a short while after he posted his update, is quite unusual. Why would someone be taking radiation readings and updating their website the day that they were planning to kill themselves? According to Fukushima Diary, none of his blog posts suggested that he might be suicidal and “he sounded motivated to measure around Tokyo,” something which hardly seems befitting of someone on the verge of taking their own life. This is not the only anti-nuclear official who has died in recent history. In fact, it was reported on January 3, 2012 that 64-year-old Uemura Yasuhiro, town councilor of Kowaura Minamiise Machi Mie was found dead in his car with a shotgun wound to the chest. Yasuhiro was reportedly taking his shotgun to his farm to keep away crows. Police thought it was suicide or a gun accident, even though the shotgun was reportedly placed outside of the car. He was an outspoken opponent of the construction of the Ashihama nuclear plant of Chubu Electric Power and after the Fukushima incident he began traveling around Japan lecturing about the dangers of nuclear power. If only one official who came out against the horrors of Fukushima had perished in mysterious circumstances I would be more ready to discount the possibility of foul play. However, when multiple bodies start piling up, all of which are connected to bringing the dangers of nuclear power into the sphere of public debate, I have to start wondering. I don’t know how it is in Japan, but here in the United States we have what I call a “dual justice system” which treats certain sectors of society completely differently than others. On one side there is the ludicrously wealthy along with police, most politicians, most so-called officials, etc. and on the other side is the rest of us. This allows for police to literally get away with murdering innocent tourists and brutally assault elderly people (with dementia no less) for no apparent reason only to get a written reprimand among other horrors. Hopefully Japan is a little different and proper investigations into these mysterious incidents can be launched.